This Mystical ‘Giant Crystal Cave’ Will Take Your Breath Away! In the year 2000 at -300 m the Crystals’ cave was discovered. This cave is a true wonder of the underground world. It is one of the most spectacular geological and mineralogical discoveries ever made. It contains selenite mega crystals, some 11m in length and one meter thick. These are much larger than any crystals of this type ever found. The walls and particularly the floor of the cave are sprinkled with blocky single crystals that in some cases cluster to form a parallel aggregate. 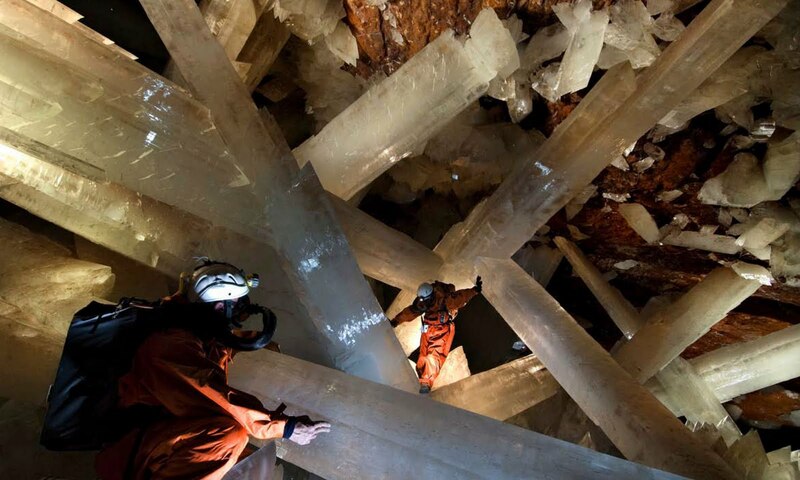 Giant elongate selenite mega crystals, the biggest ever found on the planet, grow from some of these groups of blocky crystals or directly from the floor, and some criss-cross the cave from side to side. Most of the crystals are 6 meters long but several reach 11 m creating a natural scenario of unparalleled beauty, beyond imagination, an unreal dream world discovered by chance. The cave’s temperature is 50ºC and 100% humidity, where man can survive only a few minutes. It will continue to be explored with new, specially designed gear, which allows the explorer to remain in the cave for almost one hour. The Crystals’ Cave gives us a glimpse into geological time, thanks to new space-age technology. Exploring teams, film teams and scientists continue to risk their lives at these hellish temperatures, in order to document this gorgeous underground fantasy-land for future generations. Giant Crystal Cave was discovered in 2000 by miners excavating a new tunnel for the Industrias Peñoles mining company located in Naica, Mexico, while drilling through the Naica fault, which they were concerned would flood the mine. The mining complex in Naica contains substantial deposits of silver, zinc and lead.